Inequality in America is getting worse. The gap between the "haves" and "have nots" is widening, according to the latest data out this week. The rich are money-making machines. Today, the top mega wealthy -- the top 1% -- earn an average of $1.3 million a year. It's more than three times as much as the 1980s, when the rich "only" made $428,000, on average, according to economists Thomas Piketty, Emmanuel Saez and Gabriel Zucman. Meanwhile, the bottom 50% of the American population earned an average of $16,000 in pre-tax income in 1980. That hasn't changed in over three decades. 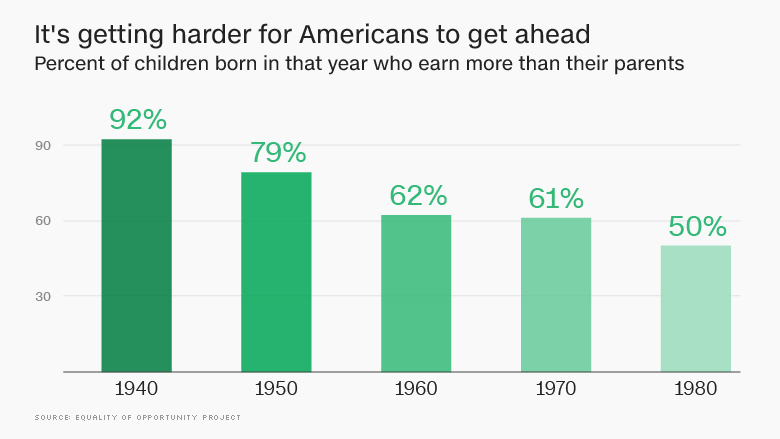 As if that's not depressing enough, living the American Dream is also getting harder to do. Millennials, born in the 1980s, only have a 50% likelihood -- a coin toss chance -- of earning more money than their parents did, according to new research released this month from the Equality of Opportunity Project. It wasn't always this way. In the 1940s, almost everyone in America grew up to be better off financially than their parents. While money isn't the only definition of success, more wealth typically leads to bigger houses, grander vacations, fancier cars and more opportunities to advance. "Children's prospects of achieving the 'American Dream' of earning more than their parents have fallen from 90% to 50% over the past half century," the researchers wrote in their report. The wealthy didn't always take such a big share of the proverbial "pie." In the 1970s, a decade generally seen as fairly prosperous, the top 1% of Americans earned just over 10% of all U.S. income (i.e. the "pie"). Over time, the rich became more lucky -- or more greedy. 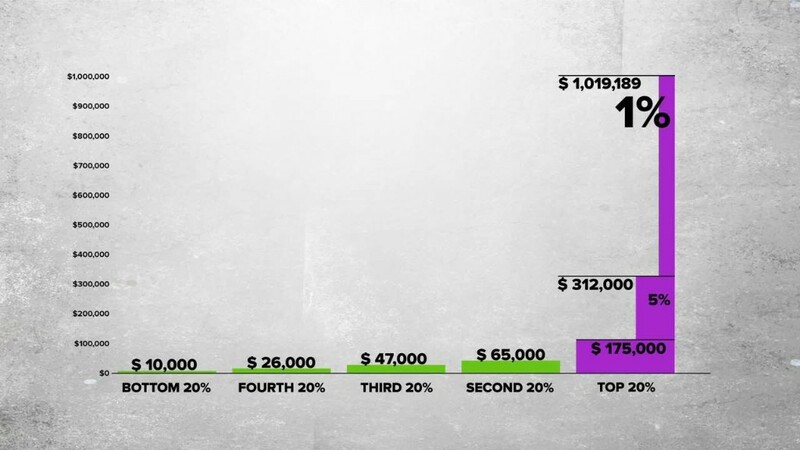 Today the top 1% take home more than 20% of all U.S. income. As the wealthy earned more, someone else in America had to get less. 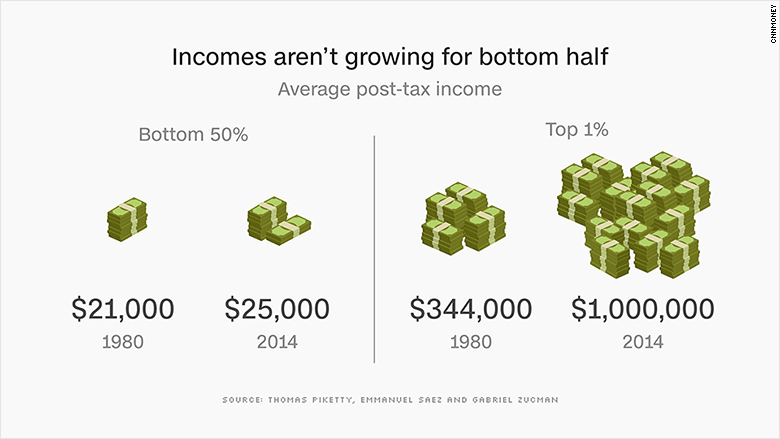 The bottom 50% went from capturing over 20% of national income for much of the 1970s to earning barely 12% today. The turning point started around 1980, as seen in the graph below. 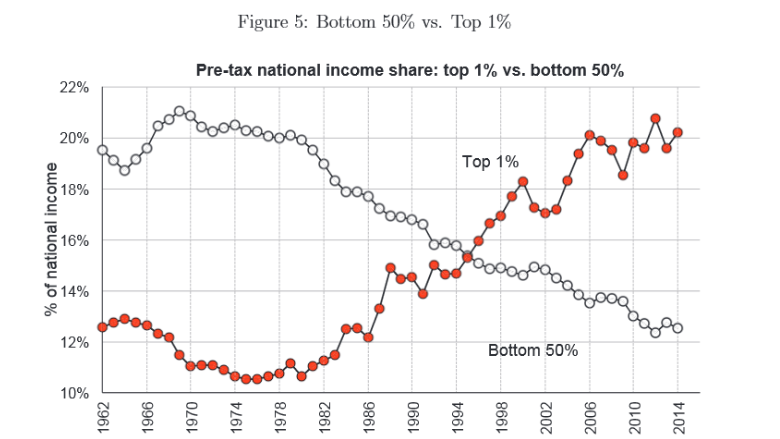 By the mid-1990s, the fortunes of the top 1% were clearly on the rise and those of the bottom half were declining rapidly. The Great Recession hit everyone hard. While job losses hit the bottom half, the tanking of the stock market and the sharp drop-off in home and property values caused the wealth of the top 1% to also fall dramatically. Around 2009 and 2010, inequality narrowed slightly because the rich had lost a lot of wealth. But since then, inequality has grown and is on track to widen further. The wealthy have recovered far faster as the stock market has surged over 230% since bottoming out in March 2009 and property values have shot back up to pre-recession levels. In the meantime, wages for the bottom aren't moving. The U.S. tax system is supposed to help the poor. Yet even after-tax income shows that the bottom 50% averaged just $25,000 a person in 2014, according to the latest data. That's just a touch above the $20,000 someone in the bottom half earned way back in 1974 (after adjusting for inflation). "Income has boomed at the top: in 1980, top 1% adults earned on average 27 times more than bottom 50% adults, while they earn 81 times more today," write Piketty, Saez and Zucman.